In a world of increasing partnerships and collaborations, the number of audits and inspections continues to grow. At the same time, Health Authorities are increasingly more targeted in their scrutiny of biopharma companies and their outsourced providers. 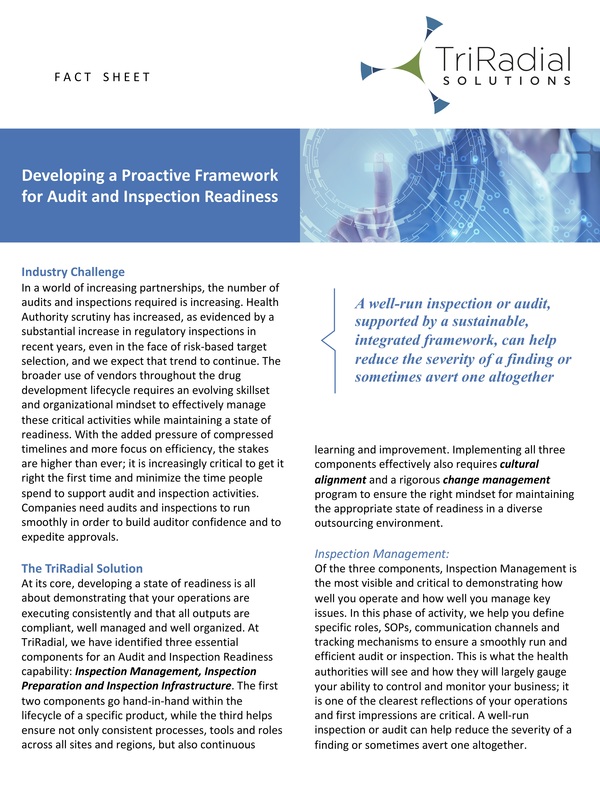 Companies therefore need a structured approach to ensure they can maintain a continual state of readiness at all times and have the skills needed to efficiently and effectively host audits and inspections anywhere in the world. We approach readiness planning in three distinct phases to ensure that you can rightly demonstrate that your processes and outputs are compliant, well managed and well organized. We help you to define roles, stepwise plans and tools to manage each step of the process and provide transparency to potential emerging issues, allowing you to address them before they become problems. Implementing this discipline across the organization builds confidence with regulators and all key stakeholders, both internally and externally.